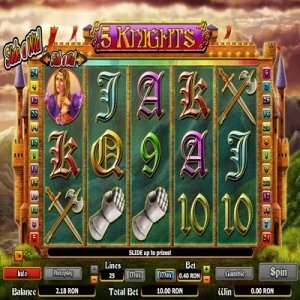 [miau] If you are looking for a video slot machine game that is a little more interactive, welcome to the 5 Knights Slot game. Unlike any other slot game you have ever played, you have the ability to control the wild symbols from the onset. If you take a close look at the top of the reels you will see a little slider. This can be moved over one of the five reels and acts like a stacked wild symbol during play. If you want to unlock the riches in the castle, the 5 Knights game will definitely put you up to the challenge. The 5 Knights slot comes with 25 pay lines and 5 reels, and you even have the gamble bonus feature where you can double or quadruple your winnings if you are brave enough for that challenge. This wonderful game does not hold back on bonuses or compelling graphics. At any time during play, a barrage of arrows will be hurled towards the castle, where a knight will appear and deflect them all with his shield. The graphics are incredible, and there is so much going on that you will enjoy hours of play on the 5 Knights slots.NextGen has really taken things to the next level with 5 Knights. The most incredible feature of this slot game is the interactive sling wild. This little bar is sitting above the reels and can be moved to the top of any reel you choose. Depending where you leave it, the size of the wild changes. If a wild lands under that slider, it becomes stacked. If placed on reel one, it is a 2x multiplier. The 2nd reel is a 3x multiplier, the middle reel is 4x multiplier. The next to last reel is a 5x multiplier, and the last reel is the highest, a 6x multiplier. The symbols of the 5 Knights slot are all medieval theme related. There are the standard Ace, King, Queen, Jack, Ten, and Nine symbols. Then you have the knights glove, his sword, the fair maiden and the mighty knight. The castle symbol is the scatter, and if three appear on the reels in any position, the bonus is activated. Here you receive 15 free games in which all the prizes are doubled. This feature can be retriggered if another 3 castles appear on the reels. During play on the 5 Knights slot, the slider feature can not be turned off. You can either move it in between each spin or simply leave it in the same position for the entire time you play. If you would like the game to do all the work, simply hit the autoplay button and you will not have to press the spin button in between each turn. After each win, you will be prompted to gamble your winnings for a chance to double or quadruple your money. The gamble button is sitting to the left of the spin button. If you are looking for a fun way to be in control of the game, the 5 Knights wild slider is an innovation in itself. Now you determine when and where the wild symbols are stacked, giving you the power to take over and win the lion share of cash.